The Breville BDC600XL YouBrew Drip Coffee Maker comes with an abundance of features, including a built-in bean hopper and burr grinder (it can also be used with pre-ground). There are a number of settings to choose from, with single cup and carafe buttons that allow the user to select the amount of coffee brewed each time. The You Brew is programmable and has a high cup height which can accommodate travel mugs, so the user can brew coffee straight into the vessel of their choice. 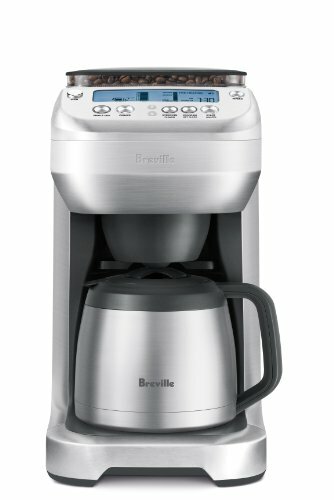 The Breville BDC600XL also comes with a 12-cup thermal carafe. There’s also a glass version of the YouBrew available (the BDC550XL), which retails at $230. This model comes with a glass carafe and hot plate (with manual/auto switch off) for keeping the brewed coffee warm. The other features are the same as the BDC600XL. The first thing to note about the YouBrew is its impressive size! With its 9w x 14d x 16.2h-inch dimensions, this is not a coffee machine for anyone with limited counter space. This is a study silver machine that looks as if it’s built to work hard. Part of this extra size is due to the built-in grinder – not a feature you find on most coffee makers of this type. This alone lifts it into a whole new class of drip coffee maker and helps justify the elevated $250 price (you can buy a decent home drip brewer for less than $100). It’s worth noting that you can still use pre-ground coffee in the YouBrew (there’s a permanent gold filter and you can also use paper filters). Simply reading through the list of features on the YouBrew causes the mind to boggle. 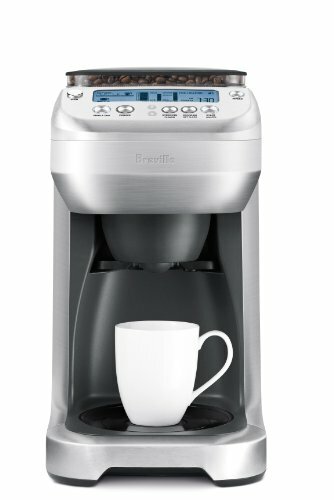 In fact, it feels as if Breville has carried out a brainstorm exercise to find everything a home brewer could possibly want in a drip coffee maker and then designed a machine that tries to accommodate every last one. For example, you can choose to brew anything from the whole 21oz (12-cup) carafe down to a 7.5oz single cup. You can dispense the coffee into a cup or mug of your choice, with a cup height that accommodates tall travel mugs and flasks. Even before you brew a single drop, there are all kinds of choices to make, such as the volume of beans in the grind, the pre-soak time you prefer and the strength of the coffee, which adjusts the amount of water used. In addition, there are five aroma options. In short, this is certainly not a coffee machine for the indecisive! If you can’t handle all those choices first thing in the morning, there is a programmable feature which means you can dial in a time for the brew to start. All of these features are accessed via the imposing control panel, which features a large LCD screen and nine LED-lit buttons. As you might guess, the YouBrew is not the most simplistic coffee machine on the market but the design is superb and, all those options notwithstanding, it is user-friendly. It is also easy to fill, which is often a negative with drip coffee makers. There are some nice extra touches too, including the water level indicator, which includes an overfill warning. There’s no getting away from the fact that cleaning the YouBrew is kind of a chore, as each part needs careful attention. As with other drip brewers, there’s the carafe, coffee basket and filter to wash in warm, soapy water. Beyond that, there is the grind catcher and drip tray, as well as the removal of calcium build-up. The screen lets you know when the scale build-up removal process is due and interestingly Breville recommends a mixture of water and vinegar (although a special de-scaling agent can also be used). As the YoBrew has a built-in grinder, you also need to clean the grinding burrs and coffee chute. For the burrs, a special cleaning brush is provided. The problem with having so many features is that it takes time to perfect the perfect brew. The drip coffee maker should arguably be the essence of simplicity, a fool-proof method of brewing that requires none of the fine adjustments needed to make, for example, an espresso or to master the Chemex. By stuffing the YouBrew with so many options, it reduces the ability to produce the very thing it should do with ease – brew a perfect cup every time. It’s worth noting that the YouBrew has a relatively high proportion of negative third-party reviews that point to everything from the machine leaking to weak coffee brewed at too low a temperature. There are also concerns over the long-term durability of the machine. While it’s hard to speak as to the durability, with regards the coffee quality, suffice it to say that if you’re buying a coffee maker for this alone (not an unreasonable assumption), you can do better than the YouBrew. This is not least down to the fact that independent tests show the YouBrew does indeed fail to reach a sufficiently high temperature, getting to a maximum of around 195F (90C). The YouBrew is a strange beast – both loved and loathed by external reviewers. Fans of the machine praise its array of features, its built-in grinder and build quality. Critics point to its high price, the low quality of the coffee produced, and also the high maintenance demands. If you want simple on/off reliable functionality without all the extra bells and whistles, there are certainly plenty of other (cheaper) drip coffee makers on the market. However, if you’re looking for more control and flexibility over the brewing process, the YouBrew is worth considering. Just make sure you do your homework before you buy as it’s hard to ignore all of those negative third party reviews. Pros: This is a sturdy machine that benefits from having a built-in burr grinder for use with whole beans (in addition to pre-ground coffee). The You Brew offers a high level of flexibility over the quantity and strength of coffee brewed, including the ability to dispense coffee straight into a cup or tall mug, as well as the standard 12-cup stainless steel carafe. Cons: There is a real question over the quality (and temperature) of coffee the YouBrew is capable of brewing. The maintenance is relatively burdensome, requiring regular attention to keep the machine running correctly. The range of features on offer may be above and beyond what many home brewers require from their drip brew maker. It’s also hard to ignore the number of negative third-party reviews of the YouBrew. The Breville BDC600XL YouBrew Drip Coffee Maker is a cut above most drip coffee makers on the market and this is reflected in the $250 price tag – but while it offers much in the way of premium features, there are questions about its long-term durability, maintenance demands and, crucially, the quality of the coffee it produces.